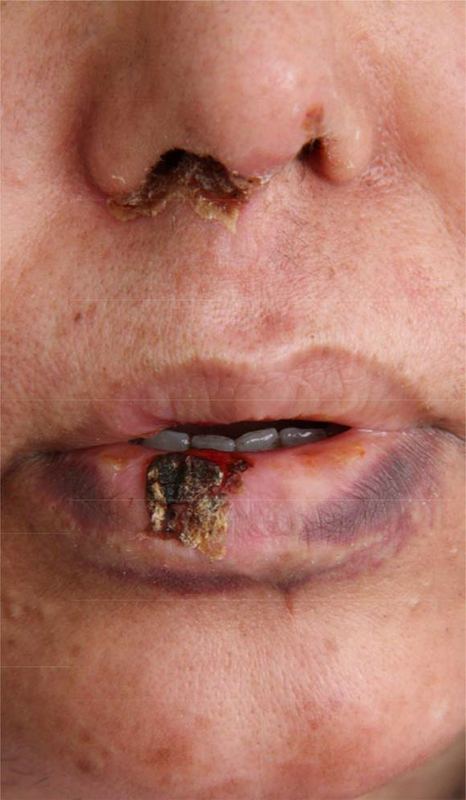 To Cite: Ebadi A, Abdollahimajd F, Nazari S, Nasiri S. Refractory Ulcerative Lesions on Lips and Nose of a Patient With Systemic Lupus Erythematosus, Arch Clin Infect Dis. 2012 ; 8(1):e16033. doi: 10.5812/archcid.16033. 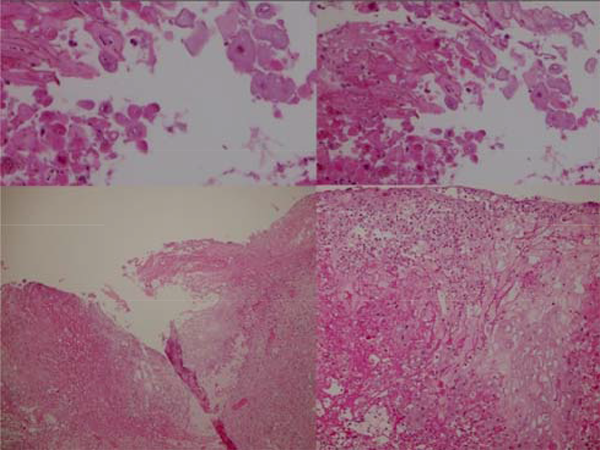 A 37-year-old female was seen as an in-patient on the rheumatology ward of Loghman-e-Hakim Hospital, Shahid Beheshti University of Medical Sciences, Tehran, Iran, for the evaluation of her refractory ulcerative lesions. She had a three year history of systemic lupus erythematosus (SLE) with an insidiously deteriorating nature, which waxed and waned through time. She was hospitalized in order to get thorough treatment though with some potential side effects for the disease flare up using high doses of Cychlophosphamide and Prednisolone. Two days after initiating the treatment, ulcerative lesions developed on the nose and lip. The lesions were painful and appeared to be lupus oral ulcers, but in spite of the difficult process of the therapy regimen, the lesions was insidiously progressing over weeks without any sign of improvement and eventually dermatology consultation was obtained after one month delay. When we visited her, she was free of any systemic symptoms. Physical examination revealed ulcerative lesions on the upper and lower lips as well as on the nose. Ulcers were surrounded by elevated borders admixed with central crusts and necrosis (Figure 1). In addition, the patient had mild, non-tender and right submandibular lymphadenopathy. Other examinations were unremarkable. Laboratory tests showed a leukopenia (WBC: 1300) with 80% neutrophils and 20% lymphocytes. - To confirm the diagnosis, a skin biopsy was achieved (Figure 2). - Now, what is your diagnosis? Tzank smear and biopsy specimen were obtained (Figure 2). Microscopic examination revealed a reticular degeneration and spongiosis of the epidermis, ballooning of the cytoplasm of keratinocytes and intranuclear inclusion bodies, multinucleated giant cells (are formed by fusion of the infected keratinocytes) and inflammatory response of lymphocytes, neutrophils and eosinophils infiltrate in the dermis. The results were consistent with the diagnosis of HSV infection. Therapy with oral acyclovir was then initiated (400 mg po × 5/d/14 days). After one week, the lesions were markedly improved (Figure 3) and they were completely healed after two weeks. HSV-1 and HSV-2 produce primarily orolabial and genital herpes infections. Their clinical presentations are influenced by several factors including viral entry root, degree of immunocompetency and nature of the virus. They have a wide range of clinical presentations, ranging from limited mucocutaneous disease to fatal dissemination particularly in immunocompromised conditions. Initial lesions appear as painful vesicles on an erythematous base followed by pustules and/or ulcerations. Resolution of symptoms occurs within 2 - 6 weeks. In general, the most common sites of involvement are mouth and lips. Less common sites are perioral skin, nasal mucosa, hard palates, and cheeks. In immunocompromised patients, recurrent herpes infections can involve intraoral 'soft' mucosa (1-4). Oral herpes simplex virus (HSV) infections may be severe particularly in immunocompromised patients and may be associated with serious morbidity, potential secondary infections (such as bacterial and fungal infections) and systemic dissemination. They may frequently be misdiagnosed due to their atypical presentations (5). Immunocompromising conditions include congenital immunodeficiencies, AIDS, hematological malignancies such as Leukaemia, autoimmune diseases such as SLE and iatrogenically induced immunosuppression as seen in organ transplantation. In hospitalized and/or immunocompromised patients, prompt and accurate diagnosis of infectious diseases such as HSV infection is critical and urgent dermatologic consultation for atypical mucocutaneous presentations may prevent common delay in diagnosis. Hence, it helps physicions to settle appropriate treatments, prohibiting progression to potentially serious and fatal outcomes (6, 7). Characteristics of atypical infections in immunocompromised hosts include deeper and larger size of lesions, more profound ulceration, satellite lesions, long lasting lesions with longer healing time and atypical locations (3). Verrucous, exophytic, pustular or ulcerative lesions can also be seen. Respiratory and gastrointestinal tract can be involved as well. 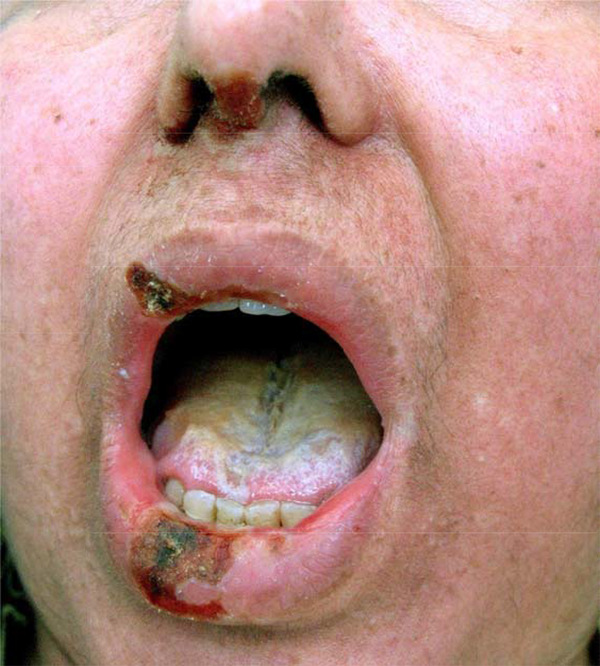 Differential diagnosis of oral lesions in these patients includes candidiasis, other oral infections (such as deep fungal), herpes infection, mucositis, and malignant infiltration. Diagnosis can often be achieved by history, physical examination and a Tzanck smear. In immunocompromised patients, a direct fluorescent antibody test, viral culture or skin biopsy with immunohistochemistry may be required for definitive diagnosis. In these patients, acyclovir therapy should be initiated (8-10). When a clinician evaluates immunocompromised patients with chronic ulcerations and necrosis, it is important to keep herpetic infections high on the differential diagnosis in order to avoid serious and possibly fatal outcomes. Given the patient under study, she also presented with chronic ulceration along with necrotic area within them and she responded well to acyclovir therapy. We would like to thank Dr Sajjad Nazari for taking photos of our patient. Implication for health policy/practice/research/medical education: When a clinician examines immunocompromised patients with chronic ulcerations and necrosis, it is important to take herpetic infections into consideration in order to avoid serious and possibly fatal consequences. Authors’ Contribution: Data collection and drafting of the manuscript were carried out by Dr Abdollahimajd and Dr Ebadi. Dr Nazari cooperated in writing the manuscript. Critical revision of the manuscript was made by Dr Nasiri. Financial Disclosure: There are no conflicts of interest.